Mijas las Lagunas is a coastal ciity, relatively far from the old town of the municipality of Mijas. It developed rather independently in the Costa del Sol with the growth of tourism and housing. As a result of this development it is in terms of population the most important part of Mijas. The Mediterranean highway which passes right through the core of the village presents the main access to both Mijas and Fuengirola, the neighboring municipality which actually forms a functional unit with las Lagunas. 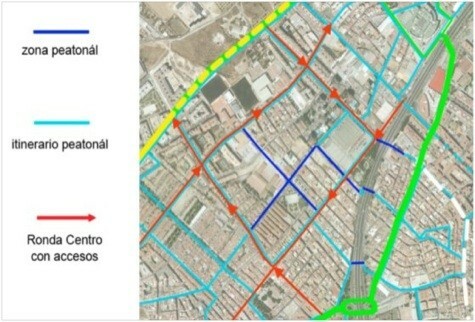 to soften the jump of scale in the road hierarchy when leaving the highway and entering directly into a narrow downtown street network, generating significant traffic problems. areas with pedestrian priority and closed to public traffic. rapid completion of an existing residents parking scheme. 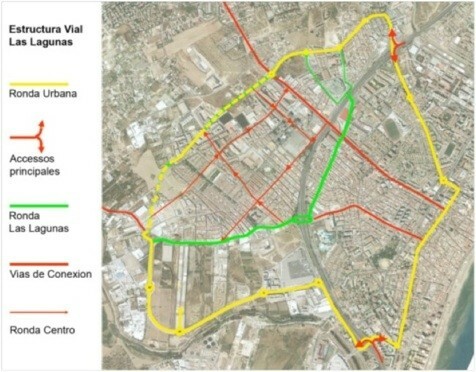 Urban Public Transport is currently provided by the Consortium of Malaga. However the west and the outer areas are practically without service. We propose the creation of two urban lines. One has a short, centric route entering the pedestrian zone and providing access to the new center. The other one provides a basic service to the widespread outskirts of the village which hast a significant percentage of the population who do not have any public transportation services at the moment. We also propose the extension of the service of the consortium to the west of the nucleus. 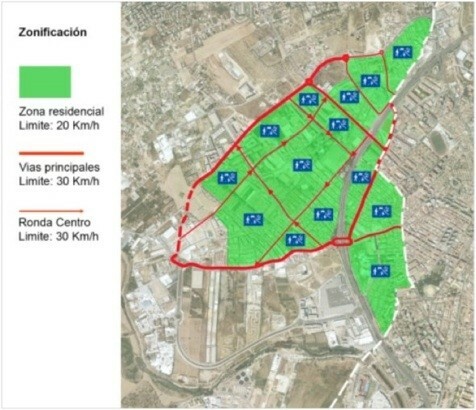 Regarding the cycling mobility we propose the creation of a common network of secure separated cycling-tracks between Mijas and Fuengirola. Both together form an area whose distances and weather conditions are nearly perfect for the everyday use of the bicycle as an alternative mode of urban transport. Functionally we consider it the most convenient and the fastest transport mode available in this area. Elaborated for the department of Transport of Prointec SA.